As the captain of an interstellar spaceship you are responsible for the well-being of your ship. You need to setup a secure line to exchange information between your crewmembers. You are going to use a technique that was created 200 years ago called VRF Routing. Back then this technique was the basis of MPLS and you need to make sure your crewmembers fully understand it before they dive deeper into MPLS….engage! Router Sulu and Chekov both have a loopback0 and loopback1 interface we are going to use for VRFs. Configure VRF SULU on router Sulu, add the loopback0 and loopback1 interface to this VRF. Configure VRF CHEKOV on router Chekov, add the loopback0 and loopback1 interface to this VRF. Configure the tunnel1 interface on both routers. Make sure the source and destination IP addresses of the Fastethernet link are used for this. Make sure the tunnel1 interface is added to VRF SULU and CHEKOV. Configure the 192.168.21.0 /24 subnet on the tunnel1 interface. Configure EIGRP AS 12 as the routing protocol for these VRFs. Make sure both routers can ping each others loopback interfaces. basically we want vrf SULU to communicate with vrf CHEKOV, right? I will add the solution next week. 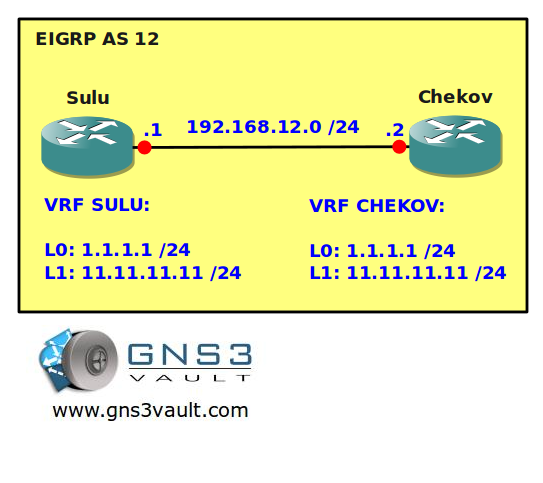 On EIGRP on CHEKOV, You have to put network prefixes under “address-family ipv4 vrf CHEKOV. This autonomous-system number is very important because remember these are separate VRF’s. So basically once EIGRP transfer the packet from the tunnel interface, its going to look for autonomous-sytem to see if it matches. Other wise EIGRP will think that his/she going be in separate EIGRP domain. Thanks you Mauro for the discussion we had on FB regarding this task. I am new to MPLS too. By the way thank you too for reminding of the task as I did not pay close attension to what was specifically said. You said, that both loopback interfaces should be pingable from each end regardless which VRF you are pinging from. This solution below did just that. May be someone else or Rene can help us complete of fine tune the solution. The Tunnel is reachable from each end BUT can be improved to behave just like the loopback interfaces for VRFs SULU and CHEKOV. Note to Mr. Rene. I watched you newly uploaded videos on Youtube two weeks ago. From what, I’ve seen, I can imagine the same can be applied to this task. Thanks to you and Mauro. Lets keep learning….! I thought that idea too , but the lab ask : Configure VRF SULU on router Sulu, add the loopback0 and loopback1 interface to this VRF. So no local VRF SULU ON CHEKOV and viceversa. I’ll upload the solution this week. I think this is a good lab because it teaches you the basics of VRF before moving on to more complex MPLS scenarios. I’ll add it to this article soon. the topology picture says that loopbacks on each router should have the same addresses(1.1.1.1 and 11.11.11.11) but there are different addresses in your video solution (1’s for SULU and 2’s for CHEKOV). It may confuse peoples and misleads from what they really should achieve in this lab. 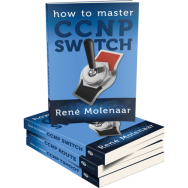 Hi , Recently, I brought CCNP switch book so i just want to know that is VRF part of CCNP route ? 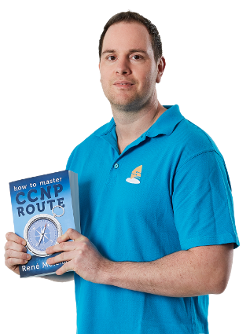 if no then have you introduced any book which is relating to VRF and MPLS. Currently, I am CCNA certified but i do not know about VRF relating configuration. Currently, In my organization there is a use of VRF. I want to become master for VRF and other thing. I am new to my organization. I have the exact same config as the video solution but I am still not able to make it work. Also, my tunnel interface is showing down. Here is my config.